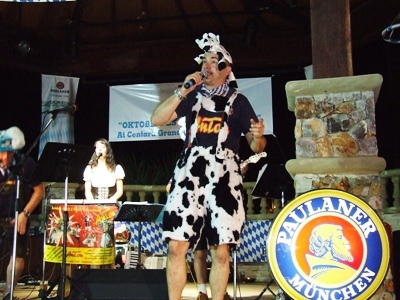 The calendar may have said “November,” but at the Centara Grand Mirage Hotel & Resort the Thai-German Chamber of Commerce’s Oktoberfest was still going strong. 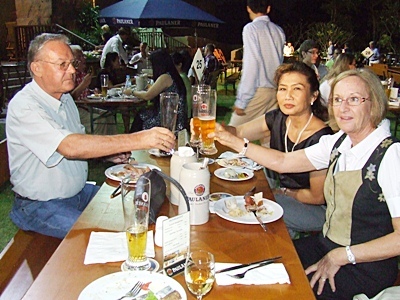 Organized in conjunction with the Norwegian Chamber of Commerce and sponsored by Air Berlin, the festival got into full swing as the rainy season came to a close in Thailand. 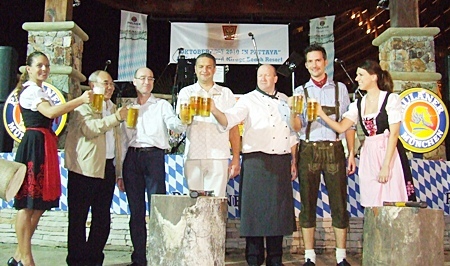 Flanked by two beautiful frauleins, Pracha Chivapornthip, President of the German Thai Chamber of Commerce, Stefan Buerkle, Executive Director of the German Thai Chamber of Commerce, Mario Beyer, Director of rooms and Andrew Brown, Executive Chef, both of Centara Grand Mirage Beach Resort Pattaya together with Stefan Magiera, General Manager of Air Berlin hold up their beer mugs and exclaim ‘Prost’ to ring in the Oktoberfest. The huge garden at the Centara Grand Mirage was filled with wooden tables and benches, the waitresses wore original “Dirndl” dresses and carried the “Masskruege” to the tables, almost in the same manner as the famous waitresses in Munich. 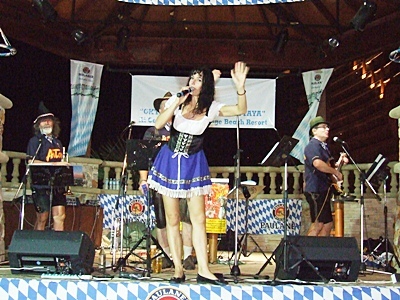 The band Anton, a group of Bavarians and Austrians fronted by a female lead singer from Salzburg, were brought in by Air Berlin and had already played at several festivals in Thailand. 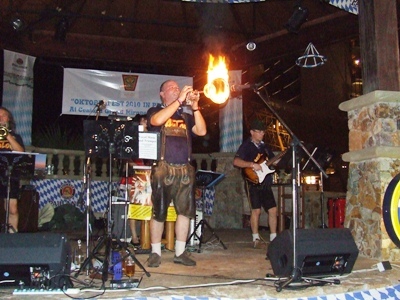 At the Centara Oktoberfest they showed their best, playing famous Oktoberfest-songs and putting on special numbers that were much appreciated by the audience. 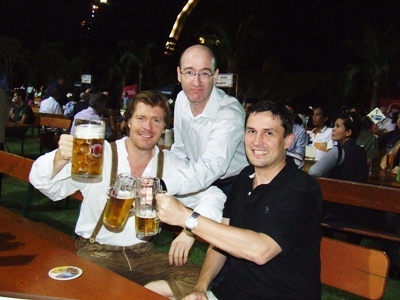 The Centara management team had a few games of their own prepared, including a beer-drinking competition won by the contest’s smallest, slimmest – and a bit ill afterward – man. Women joined in the beer drinking as well, except they didn’t have to empty a one-liter jug as fast as possible. 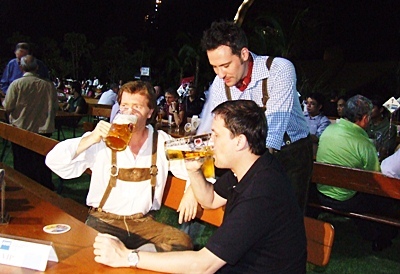 But even downing a half-liter, they showed some women can really put away the brew. 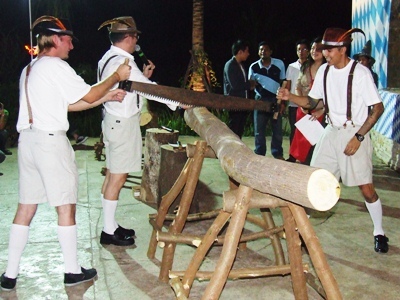 The ladies also got into the act with the wood-sawing contest, with some outdoing the spirited lumberjacks. The lucky draw also generated lots of ticket sales, with hopefuls bidding for a chance at hotel rooms and tickets back to Europe on Air Berlin. 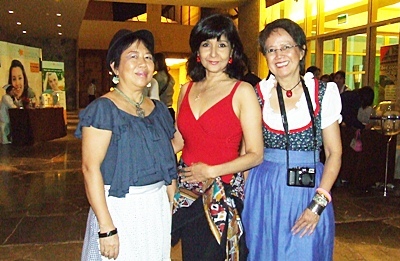 In all, Centara’s Oktoberfest proved a very original celebration and the chamber volunteers in costume made everyone feel festive, no matter what month it actually was. 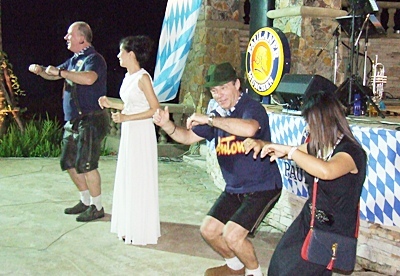 Fun and Gemuetlichkeit at the Oktoberfest.